Those brains will function much better if you take a closer look at what’s on your children’s plates. It’s especially important this month as Great Falls public school chil­dren take Criterion-Referenced Tests. Students in grades three through six take these tests to assess their reading and math abil­ities, while fourth-graders are test­ed in science as well. Studies have shown that stu­dents who eat breakfast do better academically than those who do not. One example of a better break­fast food is oatmeal, a complex car­bohydrate containing fiber and protein. Topped with berries rich in antioxidants, that oatmeal will do even more to boost brain function. Choline, a nutrient found in eggs and nuts, enhances brain and memory development, too. Scram­bled eggs with whole grain toast and fruit on the side are another great option for a test day break­fast, as is an omelet with fresh veg­etables. Complex, whole-grain carbohy­drates contain folate as well as other B vitamins that augment memory capability. Making sure the toast you’re serving is whole grain benefits your test-taking children and pro­vides the fiber they’ll need for their brains and bodies throughout the morning. Serving hot chocolate on a chilly morning will help keep the brain sharp, too. Food scientists have found that a cup of hot chocolate contains a high concentration of healthy antioxidants. Packing a well-balanced lunch of between 600 and 800 calories is best for optimal academic perform­ance in the afternoon. Avoid high­calorie high-carbohydrate meals, which can leave a student feeling lethargic. An ideal lighter lunch is a peanut butter, honey and banana sand­wich on whole grain bread with skim milk. Peanut butter is a good source of vitamin E, an antioxidant, and thiamin, which helps the brain use glucose for energy. Another great light lunch option would be tuna fish mixed with light mayonnaise with lettuce and toma­to on whole wheat bread, an apple and skim milk. Depending on when your chil­dren’s lunch break is scheduled, teachers might have a regular morning or afternoon classroom snack time. Send a smart snack on test week or coordinate with other parents to team up and send some for the whole class. Low-fat cheese sticks provide both protein and carbohy­drates, the energy source the brain prefers. More fun than a cheese stick is a snack mix, espe­cially if you include dark chocolate, an antioxidant with mood-boosting quali­ties, with walnuts, rich in omega-3 fats essential for brain function, and dried cherries, full of vitamin C and reported to improve memory. For dinner, serve grilled salmon, which offers healthy omega-3 fats, accompanied by tricolor pasta, a complex carbohy­drate, and sauteed zucchini or any colorful vegetable. Or opt for grilled skinless boneless chicken breasts, high in good quality protein as well as selenium, zinc and B vitamins. Minestrone soup boasts such beneficial brain foods as vegetables, pasta, beans, full of B vitamins, iron, zinc and magnesium, all of which promote healthy brain function. Studies have linked drinking water to higher test scores in children. Remember to send your child off with a bottle of water or encourage them to take frequent drinks at the water fountain throughout their school day. Staying well-hydrated prevents fatigue and keeps concen­tration levels high. As a general rule, color your child’s plate with fruits and vegetables, add a healthy protein and com­plete the meal with complex carbohydrates. Avoid processed foods and snacks, often laden with added sugar and fat. Helping elementary students learn about healthy choices is an emphasis in the Great Falls Public Schools this year. Staff members are implement­ing new nutrition guidelines in response to concerns over childhood obesity and type 2 diabetes. Student Wellness Director Allison Struber publishes a parent newslet­ter, Making Yours a Healthy Home, that’s distributed bimonthly in Wednesday envelopes and addresses specific ways to adopt the new nutri­tion guidelines. The March/April 2010 issue includes news about Great Falls Pub­lic Schools-approved food labels that can be found on individually wrapped snack items in local grocery stores. Struber has placed labels on these snack items at Van’s IGA, Wal-Mart, Smith’s and 2-J’s. She said having the easily identifi­able labels simplifies shopping choic­es and increases awareness of healthy snacks. taught in the district since 1991, has seen a lot of changes in the curricu­lum regarding healthy eating, espe­cially in the last 10 years. Lester said two videos, “Portion Distortion” and “Color Your Plate,” provided by Action for Healthy Kids, do a great job of teaching healthy choices. “Portion Distortion” teaches kids to use something as simple as their hands to judge portion sizes. “As they grow, their hands grow and portion sizes grow, too,” Lester said. Kids can relate to “Color Your Plate,” a video that highlights the benefits of filling their plates with colorful fruits and vegetables. “Chances are, if you have lots of color on your plate, you are eating well,” she explained. The nutritional videos seem to be reaching kids and making a differ­ence. More than 80 percent of the first- through third-grade children surveyed said they would eat more fruits and vegetables after viewing the “Color Your Plate” video, and more than 80 percent said they learned something they did not know before. Almost 90 percent of the fourth- to sixth-graders who saw “Portion Dis­tortion” reported learning new infor­mation on food serving sizes from the video, and 71 percent surveyed said they would change the size of their food portions, according to questionnaires administered by school district Health Enhancement teachers. Action for Healthy Kids began in 2002 as a subcommittee of the Great Falls Eating Disorder Task Force, which eventually developed into Great Falls Action for Healthy Kids headed by Joan Trost. Another program teaching ele­mentary children about healthy choices is “Hooked on Health,” in which library and health enhance­ment staff create a block of time and offer a variety of demonstrations and learning activities. Stations run by community volun­teers provide hands-on experiences with activities such as dance, yoga and martial arts, exposing children to physical activities they might not have tried before. Lynn Ryerson, kindergarten teacher at Sunnyside Elementary, works hard to instill healthy habits in her students. She recently was awarded a Healthy Heroes award by the school district for her efforts in embracing the district’s wellness objectives, specifically for the yoga she does with her students. Ryerson said her kindergartners had lunch at 11 and then were hav­ing nothing to eat for the rest of the school day, which ends at 2:45. She noticed their behavior was off track and decided to make some changes. Now on Thursdays, Ryerson hosts a cooking day centered around healthy foods. She’s exposing the kids to a new fruit or vegetable in the morning thanks to a grant given to her through Jennifer Spellman, school food services director. For Valentine’s Day, Ryerson said they skipped the candy and cupcakes and made strawberry smoothies instead, and the kids loved them. For Presidents Day, they made cherry cobbler with frozen cherries, substituting honey as a sweetener. As they studied teeth, they made snacks with apple slices, peanut but­ter and mini marshmallows repre­senting teeth and gums. Here are some brain food ideas from testing week. 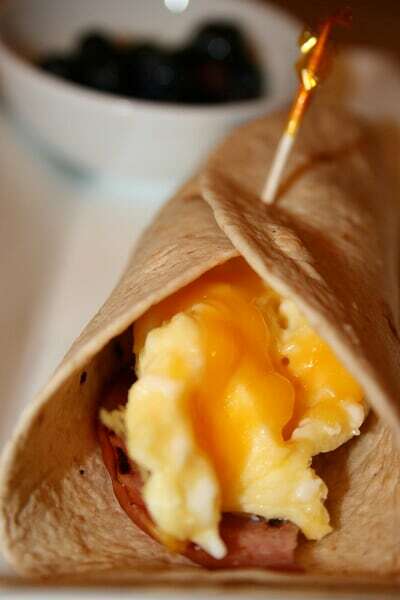 Brainy Breakfast Burrito — Tuck scrambled eggs in a whole wheat tortilla, top with one slice lean Canadian bacon, grated cheese and roll into a breakfast burrito. Serve with a side of blueber­ries. 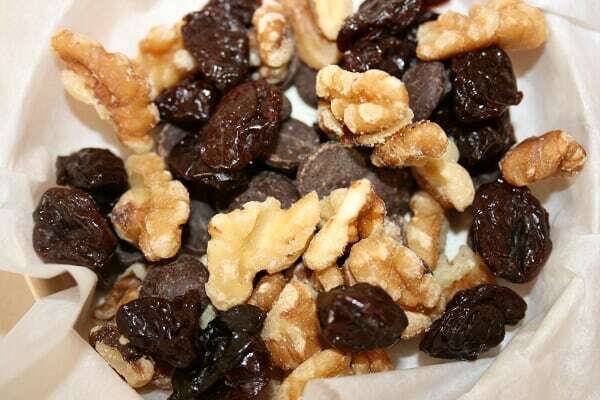 — Combine equal amounts of walnuts, bittersweet chocolate chips and dried cherries in a bowl. Stir to combine. Divide into ¼ cup snack size portions. Grilled Salmon— Preheat barbecue to 350 degrees (medium heat). Lay two sheets of aluminum foil on work surface and fold edges inward to make a tray. Lay salmon portions on top of the foil tray. Squeeze fresh lemon juice on top of salmon portions, top each with a 1 teaspoon pat of butter and sprinkle with dillweed. Place foil tray with salmon on preheated barbecue, close barbecue lid and cook for 6-8 minutes until fish is opaque and cooked through. Serve with lemon wedges. 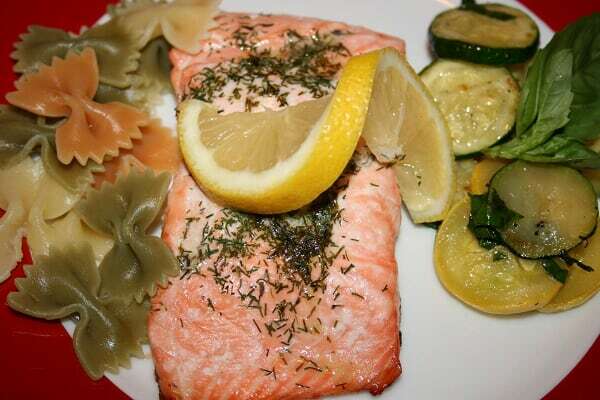 Accompany salmon with sauteed fresh vegetables and pasta.  The book, “Brain Foods for Kids: Over 100 recipes to boost your child’s intelli­gence,” by Nicola Graimes.